SMOC: Leading-edge oncology care. Compassionate, dedicated people. 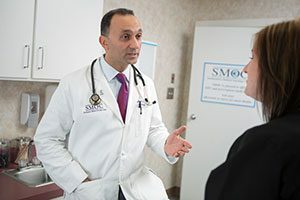 Founded in 1984, Southeastern Medical Oncology Center (SMOC) is dedicated to providing the people of North Carolina the most advanced, effective and appropriate cancer care and hematology care available today. With genuine compassion and a deep commitment to your health, quality of life and best interests, we strive to offer not just the highest standard of care but also heartfelt understanding, comprehensive support and — ultimately — hope in the fight against cancer. right here where you are. At SMOC, we use the same guidelines, methods and protocols used by major cancer centers. Plus, we have a highly capable, informed and experienced team of cancer specialists, oncology nurses and support staff who combine exceptional training, knowledge and skill to give you every chance in the fight against cancer. 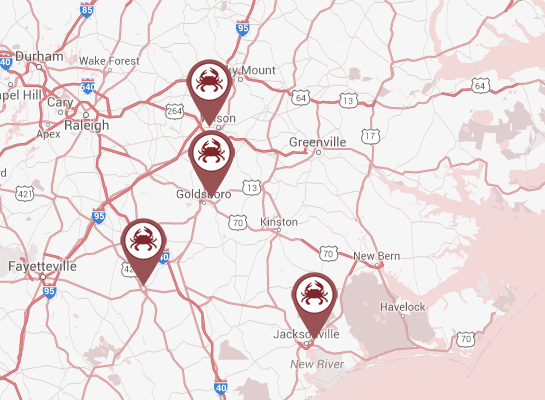 Because SMOC has four convenient locations in Goldsboro, Clinton, Wilson and Jacksonville, our leading-edge care is convenient to rural North Carolina. This is quite important under any circumstance, but particularly relevant when it comes to treatment for cancer. At SMOC, you get the leading-edge capabilities, care coordination, trained professionals and support resources you’d expect to find at UNC or Duke. But because cancer treatment often requires multiple visits — frequently for weeks at a time — SMOC keeps you from having to make multiple long, logistically challenging trips… at a time that is already challenging enough. We’re committed to removing and reducing those challenges by making your care as accessible and convenient as possible. You get compassionate and individualized attention and support without the layers of process or the anonymity sometimes found in big cancer centers. Also, if you have problems that require you to be seen quickly, we’ll get you in that same day. Audio recordings – We record your visit and provide it on audio CD. This makes it possible for you or your family members to review what was discussed, eliminate confusion and share details with family caregivers. We’re happy to record any doctor-patient visit. Teleconferencing – Using Skype, we can include family members in doctor-patient visits, as family involvement is a vital part of cancer care and treatment decision-making. Don’t have Skype? No problem. We can conference via telephone, as well. Email – We can provide an email address so that you can send us your questions or concerns when they come up. We welcome your phone calls – Your call will be answered by a caring person, not an automated phone system. If you have questions, you’ll speak to your nurse, or you’ll receive a call back. Valonda Calloway from My Carolina Today visited our Wilson office to meet with Dr. Boyd. Watch to learn more about the treatment opportunities we provide. Expert, experienced treatment & cancer-care coordination. Whatever your needs are in relation to the diagnosis, staging and treatment of cancer, we can help. Our cancer doctors will manage all aspects of your care, from testing to treatment to ensuring you get the support and assistance you need. We have in-house laboratory services, on-site social services, in-office genetic testing and counseling, a team of financial counselors, support groups, on-site pharmaceutical services, classes and much more. When you have cancer, SMOC has the capabilities and expertise you need… and the caring, commitment and convenience you or your loved one deserve. For more information, call SMOC today at 919-580-0000. Or schedule an appointment online.